Back of card: Based on the 2 of Wands, shown above. Printed in blue & white monotones. As the image is printed both right side up (bottom half) & upside down (top half), these cards may be inverted. Booklet included: Yes, 2.65 x 4.75 inches, or 67 x 120 mm. Instructions in English, French, Spanish, Italian & German. 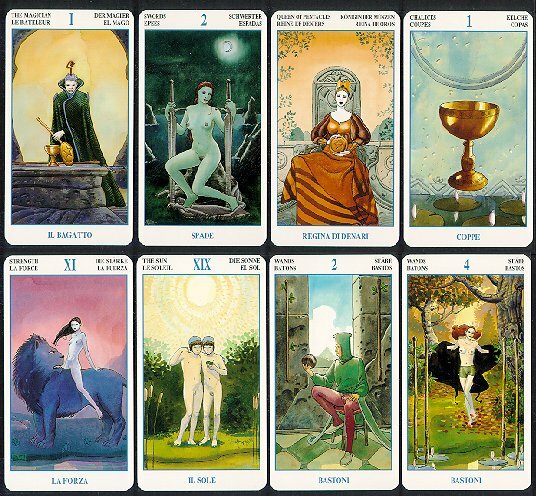 Complete with notes about The Land of Secrets (major arcana) & each of the four Kingdoms (suits). Comments: One of the most interesting things about this deck is the cards are packed out of order. I see this every now & then with decks, it usually means someone at the factory dropped the cards on the floor just before they were to be wrapped & picked them up in a hodge-podge fashion. But not this deck. Pay attention when you open this deck for the first time. Sort the cards by suit. They will appear to be in no particular order. Now sort the cards in each suit. Surprise! In Italian, this deck is titled, I Tarocchi dei Segreti. What is the "secret" to this deck? It appears to be the Journey of the Fool. On a long journey he is suddenly wrapped in a thick fog & when it lifts he is in a strange new world & has strange new adventures. It is the usual tale of initiation. Chalices are the Kingdom of Pleasure. The secret of the kingdom: The prince wants to marry a commoner, but as such a woman is unacceptable to the kingdom (so says his uncle), the prince must first embark on a cruel adventure through the desert. The prince succeeds & returns in time to stop his uncle from murdering his father, the king. Sounds a bit like a prologue to Hamlet. Pentacles are the Kingdom of Richness. This is the story of an enterprising young pauper who inherits a lot of money from an uncle. He then embarks on a life of skilled enterprise & gradually amasses fame & fortune. His wife embarks on a shallow life of social climbing. In the process they somehow forget to have children, until one day the aged entrepreneur meets up with the son he never had. Swords are the Kingdom of Sorrow. There seems to be no story here, only a lament for sons lost in battle. Wands are the Kingdom of Human Work. In this story, the young prince wanders a hostile landscape, searching for his mate, herself imprisoned in a far-off castle. After much struggle & many battles, they meet. The prince is happy, but is he content? No. He can never be content. He must slave & toil his life away. Much of this deck is based on Rider-Waite images, with the Wheel of Fortune from the Marseilles deck thrown in for good measure. A quick glance does not show cards that support these stories, but I'm not sure that's terribly important. Note, as of November 24, 2005: This deck is available again, after an absence of several years. I have not opened the new edition, I am presuming the long panes have been replaced by a proper booklet (now standard in Lo Scarabeo decks), and that the notes about the Land of the Secrets remain. The box for this deck is now printed in English & Spanish: El Tarot de los Secrets (rather than Lo Scarabeo's customary Italian), presumably at the behest of the importer, Llewellyn. They have a large Spanish-speaking market.